A piece of space memorabilia once bought for less than $1,000 is expected to fetch between $2 million and $4 million at an upcoming auction. 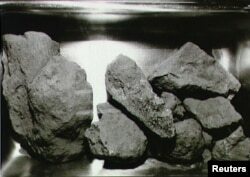 FILE: Scientists are studying the composition of lunar rocks, such as these brought back by Apollo 11 astronauts. "This seemingly modest bag ... played a crucial role in the most important scientific task of the Apollo 11 mission — to bring back the first sample of lunar material ever collected. To be able to see such an object in person is a once in a lifetime opportunity," said Cassandra Hatton, vice president and senior specialist in charge of the space exploration sale at Sotheby's. "It is one thing to read about going to the moon; it is quite another to hold in one's hands an object that was actually there and still carries traces of that faraway place," Hatton added. The bag was involved in a lot of drama before ending up at Sotheby’s. It’s unclear how NASA lost the bag, but it eventually ended up in a private museum called the Cosmosphere in Hutchinson, Kansas. The owner of the museum was later convicted of stealing and selling space memorabilia. In 2015, the U.S. Marshals Service mistakenly put the bag up for bidding, but it took three auctions to finally sell for just $995. The highest bidder, Nancy Lee Carlson of Illinois, decided to send the bag back to NASA to test its authenticity. 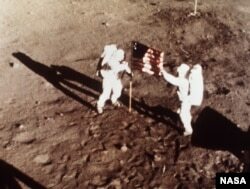 "Scientific tests revealed the dust in the bag to be moon dust, specifically from the Apollo 11 landing site and a part number printed inside of the bag matched up to that of the ‘Contingency Lunar Sample Return Decontamination Bag’ listed in the Apollo 11 stowage list," Sotheby's stated. NASA did not have any records of having released the bag and decided not to return the bag to Carlson. It did offer to reimburse her the $995. Carlson sued, and in December of 2016, judges ordered the bag returned to her. She took possession on Feb. 27 and consigned the bag for auction at Sotheby’s. While the bag appears to be a rare case of Apollo memorabilia in private hands, there are other souvenirs from the missions, including patches and medals, most of which were carried by astronauts specifically as souvenirs. According to Space.com, the highest price paid for an Apollo souvenir was $1.625 million for a Bulova watch worn on the moon in 1971 by Apollo 15 astronaut David Scott. Sotheby’s said Carlson will give some of the proceeds from the moon-rock bag auction to various charities.